Powers: A belief that everything can be improved. Super-suit has an array of strength enhancements built in. Sharpman's reputation often keeps him from having to do anything but show up. Weaknesses: The world believe's Sharpman has super strength. Living up to being the smartest man in the world is a constant challenge, even for the great mind of Justin Wise. When Justin started working at the Philmore Meinz Library he made a goal to read every book by the time he graduated high school. He finished that goal a year early. Justin believes a person can use 100% of their brain, maybe even more. Justin's brain actually weighs 1½ ounces more than the average human being. Justin Wise is a man obsessed with knowledge. Justin tried adding morals to the school system's curriculum. After Justin's idea was rejected, he created the larger than life hero; Sharpman. A mascot for education. 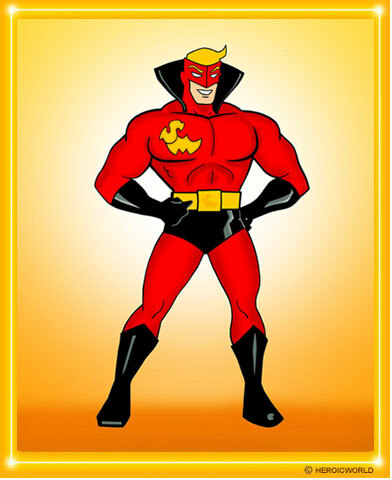 Through sheer luck and ingenious, Sharpman became a superhero, and earned the title as the smartest man alive. Although secretly a millionaire, Justin lives modestly,holding onto his job as a librarian. However when it comes to Sharpman, he spares no expense. Stacey Tuffelson is considered one of the smartest people that Justin Wise knows. Ever since Stacey got her job at the library, Justin and her have become close friends. Stacey sees Justin like a brother. Justin is always a shoulder to cry on when Stacey is having boyfriend troubles. Stacey knows that Justin is secretly infatuated with her but she also knows a romance between them would destroy their friendship. Stacey is one of the few people in Oxford who is not too impressed with Sharpman. Janice Brainstrom began working at the Philmore Meinz Library the day the doors opened. And has been there ever since. She knows that Justin Wise is Sharpman, but she plays along with his game. When the library almost shut down, Janice Brainstrom was relieved that Justin Wise bought it, and even kept it under her name. How does she feel about Justin being Sharpman? She was the one who gave him the '58 corvette that he converted into the Sharpmobile. When Douglas Firr was a child he accidentally burnt down his school's Christmas tree. As punishment, his parents never celebrated Christmas. He was bitter seeing his peers enjoy the holidays, he plotted to one day get revenge. Firr grew up and became a software giant. He shocked the business world when he sold it to start an ornament company. It was even more shocking when he became the companies new mascot. "Christmas Tree Man", A living symbol of holiday cheer. Santa's helper! With his giant candy-cane and presents that drop from his jacket, he has many fooled, but not Sharpman. I believe he can use 100% ... maybe even more."